1. Communities of Practice/Interest are social platforms that allow members of a community to share ideas and discussion. They are focused on a particular issue or topic, and provide interpersonal knowledge exchange. 2. Content collaboration is basically a library. Participants post relevant content, and thus collaboratively build the library over time. This can also include the collaborative authoring of new content. 3. Process collaboration brings the community together through a business process. Individuals collaborate based on tasks in a coordinated series of orchestrated tasks. The goal is typically process efficiency and control, including identification of the right team member at the right time. 4. Project collaboration has a defined purpose, a start and end date and clearly defined parameters. 5. Goal-based collaboration involve projects that have well defined specifically articulated outcomes or questions to be answered. The end date is basically determined by the achievement of the goal. Each model may imply entirely different kinds of functionality, governance and behavior, and may in fact indicate different (but ideally integrated) platforms. Structured vs. unstructured: In this context, structure is the degree to which the processes, roles, access must be controlled and managed, and the degree to which content is defined by well-defined states. For formal workflow and document-centric collaboration (models 2, 3 and 4), an environment that provides more control – such as eRoom or SharePoint – may be appropriate. Goal-oriented vs. continuous. Goal-oriented collaboration efforts are defined by a milestone, date or deliverable, upon the achievement of which the collaboration instance can be closed. These collaboration environments require particular focus on either a specific deliverable or set of tasks. Goal-oriented collaboration requires either dates, events or content focus that goes beyond the purely informal communities available in something like Facebook or CubeTree. 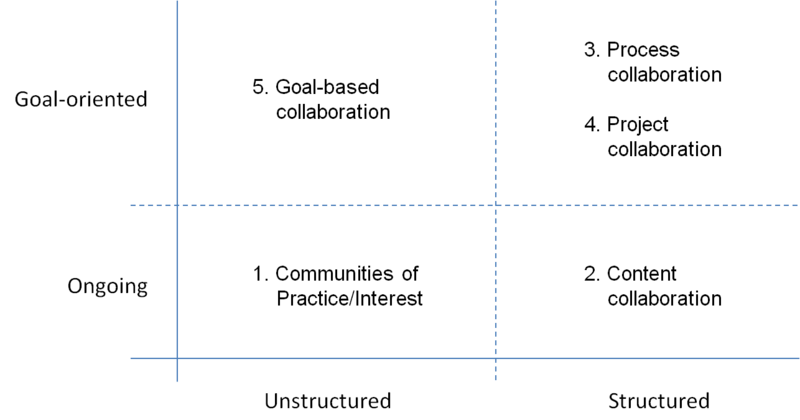 This may seem like an academic exercise, but it may be helpful when considering mapping platforms to collaboration types. For example, structured environments that support models 2, 3 and 4 might inhibit the kind of ad hoc engagement that is required in the less structured collaboration models. Imagine, therefore, using SharePoint for the structured collaboration projects, and a social environment like Jive for the less structured work. Having two collaboration platforms would indeed add complexity, though each is optimized for a different kind of function – just like Word and PowerPoint, while overlapping capability in their ability to deliver content, still have unique and differentiable strengths. Governance: a broad term, but in this case used to define what tasks to do in which environment, and how to regulate (or not) behavior and workflow in each. It seems likely that structured environments would be provisioned by administrators, while the unstructured collaboration environments could be created and managed by end-users. Integration: Ultimately, all content – whether in a structured or unstructured environment – should be treated as an organizational asset, and made easily available to appropriate parties throughout the enterprise. This implies either a federated search model or, better, a unified content repository. Specifically, documents loaded into an unstructured workspace like Jive would ideally be stored in a common, structured repository like SharePoint. More work is required to flesh out this approach, and all feedback is welcome.